As promised, here are final pics of the studio wing, after furnishing and a bit of decor. I absolutely love my new space! Our dog, Lucy, seems to enjoy keeping me company in this light and airy space. So here it is! I've included just a few before pics as well. Before construction: Attic door at end of hallway. Construction has begun: Most of the bedroom on the left has been removed, opening up the end of the hall. Now! The entry to the studio wing. Around the corner, where the bedroom was, is a small gallery and sitting area. Standing behind that orange chair in the previous pic. Construction has just begun: At the attic doorway, looking into the unfinished attic space. Inside the studio wing, looking toward the double window that was a single window in the previous photo. Just after construction began: Two closets on either side of the dormer window are taking shape. The attic door to the hall is off to the extreme right. From over in front of the dormer window. Looking down over the garage, and the single window that was there has been replaced with a sliding glass door. Looking down over the garage, which is now my studio. From in front of the double window, with studio to the right. Looking back into the attic from the sliding glass door at the end of the garage. From just before entering my studio, my little kitchen. That shelf in the corner awaits a small microwave. As far as future plans? There is a chance that my studio will be included in the next OVAC Tulsa Studio Tour. I've yet to hear for certain, but I hope that works out. I would also like to have an open house sometime this year. And once I've had the studio all to myself for awhile, I plan to organize a class or two. My space could easily accommodate a nice number of students. So many plans! For now, I'll just make another bottle. Finally! Most of my new furniture for the studio wing is being delivered next week! A sofa, coffee table, chair and ottoman for the living area, and a chair and ottoman for my studio office area. I ordered these pieces Aug. 30 of 2016 from Joybird—I really love their furniture—but it has taken a bit too long. I'll have to wait a couple or a few more weeks for a 3-piece bookcase; one of the pieces is for the studio wing, the other two will serve as a room divider in our game room. Now that my decor is filling out, I got to thinking about smaller things, like pillows and throws and what to put on the coffee table? Books, of course—mosaic books! But I could use a couple of other things for various surfaces. Then I remembered the interesting dish?—not sure what to call it—above that I found over 15 years ago at an estate sale. It was not the colors that attracted me, but the interesting shape. I think this will work beautifully with my mid-century, retro-modern furniture. At right are the swatches for the sofa, which is gray, and the chair and ottoman. So, I'm going to finally mosaic this ceramic dish with vitreous glass in black for the bottom and feet, that chartreusey-green metallic, that is actually fairly translucent, and maybe some copper gold for the top edge. I may add some black on the interior as well. Nothing fancy—just a makeover! Gosh, it's been some time since my last post, hasn't it! The summer has been busy, and here we are into fall already. Let me give an update on my new studio wing. The studio is finished and ready for work, minus a bit of decor/furniture, and I'm getting settled in. I'm very happy with so many things about it and, although I'm not quite ready to really dig in on a new art project, I've got several things in the queue. More on that in a bit. For now, how 'bout some pics? I've included a few before pics because the transformation is just so dramatic. Hint: Hover over the images for descriptions. Before: Looking down the hall and into the unfinished attic; bedroom on left. After: Looking into new studio wing. On left, what was a bedroom is now a large closet and an open gallery/sitting area around left corner. Just around the corner and to the left. New area, was part of bedroom, will be a gallery/sitting area. Don't ask about that yellow stair wall. It's actually not that bright and is more of a straw, but still, don't ask. Just into the studio wing and to the right. Still working on finishing out this nice dormer window and formulating decor ideas. New closets on either side of window. Let me bore you with my closets. Great closet to the right of window. Ceramic, misc. stuff, stained glass, substrates, saws and some tools. From inside the closet. I just love this closet! Inside the closet. I used parts of shelving to maximize storage along the low, angled wall. Still inside that same closet. 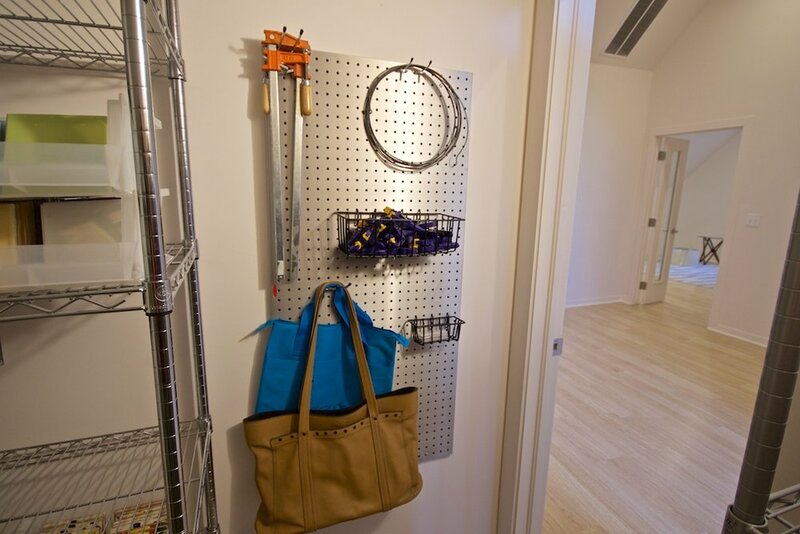 Love my aluminum pegboard! Smaller closet to left of window. All my dishes and ceramics—my Pique closet. I was really worried I would not have room for all of this stuff, and that I would just have to get rid of it. Whew! All in one little closet. And my shop vac to boot! 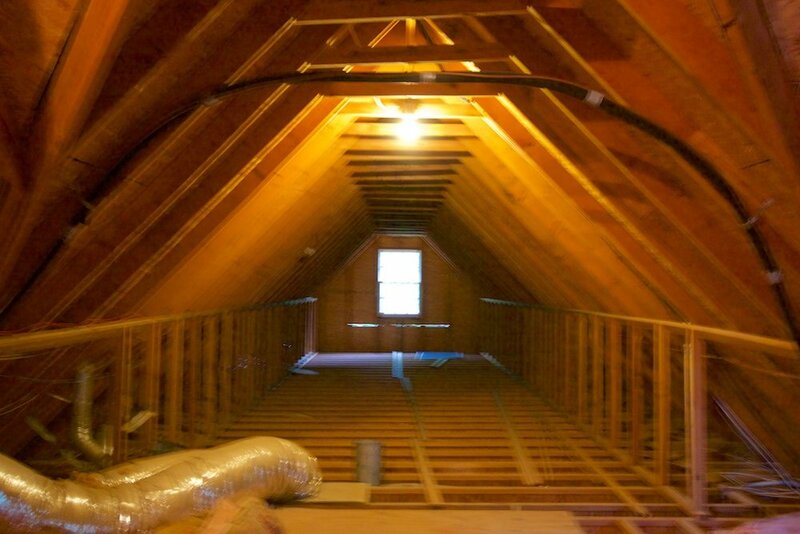 Before: Looking into attic area toward single east window. That dormer window is directly to the right. Looking into the new living area/guest room—single window now a double— of the studio wing. Decor in progress. Inside the studio living area/guest room with back to double window, let me show you yet another closet behind the center door—an awesome closet! Studio is to the right. This closet is the closest to the studio. I have some marble inventory in here, other stone. Also, office supplies, studio support stuff, and substrates. That angled door leads to a mechanical area. Just inside the closet and around the right corner. There is a large duct that we did not want to try to move, so we finished out around it, giving me a little nook that is ideal for substrates and scraps. Inside the closet, standing in the little substrate nook. Now heading toward the studio, kitchenette is on the right. Not sure why the walls look yellow in the pic; they are white. Still some decor finishing to do in the kitchen, but no hurry. To left of kitchen is the studio bath. One of my projects in queue is a little backsplash. 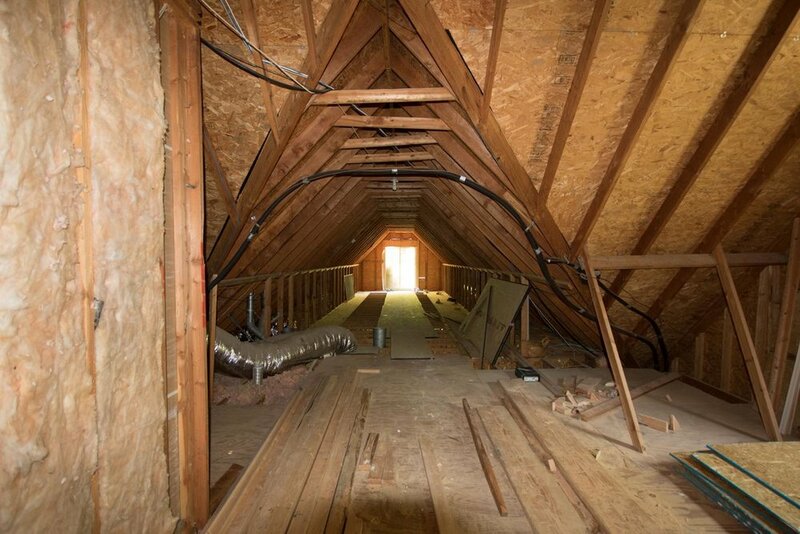 Before: After entering the attic and turning left, looking into the area above the garage. You can see that ductwork, in the lower left, that we finished out in the closet, giving me a nice shelf for substrates and scraps. Just inside the studio. Marble, stone, minerals along the wall. Tool closet in the little nook. I'm very pleased with my tool closet. Take a closer look at my tool closet! On the other side of the entry doors, my sink area. Looking into my office area. I've used an old dining room table as a work table for about 20 years now. It's big and strong. And, yes, it is elevated via pavers. Don't you dare laugh. I'm working on a more attractive elevation technique, and I'm having two more work tables made, approx. 2' x 4' each. They will be the same width and height as my current table. Smalti along the wall. Then unglazed porcelain. Van Gogh and mirror glass on the right of the sliding door. Vitresou glass. Millefiore and misc. glass at right, which is actually on the left of the sliding door. Looking back at office area. That empty space is waiting for an awesome retro-modern chair with ottoman! Turquoise. Of course. Looking back into studio from sliding door. Current project: Over 15 years ago, I made this table top for a certain offspring, who forgot that it was made for interior use and put it outside a couple of years ago. I'm reworking and replacing the edge tiles. As to what's in the queue? First up is to repair a table top that I made over 15 years ago, probably more like 18 years ago. I made it for one of my kids, who shall not be named-and-shamed here, and who seemed to forget that it was an interior mosaic and put it outside a couple of years ago. I'm reworking the edge, replacing all the tiles. My next project will be a small backsplash for the studio bath vanity. It's a small bathroom and I don't want anything too busy or complicated. I predict it will be a rather boring project. After taking care of these two small tasks, I plan on spending some time finishing a few projects. It will be some time before I start something new, but I've got plenty of ideas for when I'm ready. Okay, so that's where all things studio stand at the current time. My next and final photo shoot will probably be after the new year. By then, I hope to have furniture and decor figured out. Studio Wing, WIP (cont.) — PLEASE HELP! I'm starting to think of organization for my materials in my new studio. I'll have shelves that line the long sides of the studio, probably enough shelving for my smalti (both Mexican and Italian), and vitreous, as well as all my stone, ceramic, other glass, etc. I'll be using clear jars for the tess. In my old studio, I organized colors within material, with only the most-used materials in the immediate studio area. I've got plenty of room in the new studio to have it all—or at least most of it—on the shelves along the walls, so I'm considering how I should group things. Question: Group materials by color within material, or by material within color? Color within material: For example, I would have the vitreous grouped together I'm one area, the Mexican smalti together, the Italian smalti together, etc., with each material then grouped by individual shade and value. Material within color: For example, material within color being all the blue vitreous along with all the blue Mexican smalti along with all the blue Italian smalti, and possibly any other blue material like ceramic, C3, etc. So, all similar shades and values of blues in the same area, regardless of material. Of course, they would then be grouped by shade and value within the color. Which makes more sense to you? How is your studio organized? I welcome your thoughts! Okay, so here's the latest on my new studio! It has just been too messy in there to take nice pics, so I waited until they did a cleaning. It's looking fabulous! The walls are up and the trim carpenters are next in line, as well as the air-conditioning. We're getting there, but it's looking like end of July—certainly not end of June, especially since we have to shut down work for a couple of weeks in July while we go on vacation. View into the studio wing. Just inside the entry to the studio wing. The living area/guest room in the studio wing. Looking down into the studio from the living area. At the doorway of the studio. Inside the studio, looking at what will be my office area in the new gable. Well, this is just too good to be true! I can't believe the transformation of the attic and space above the garage. 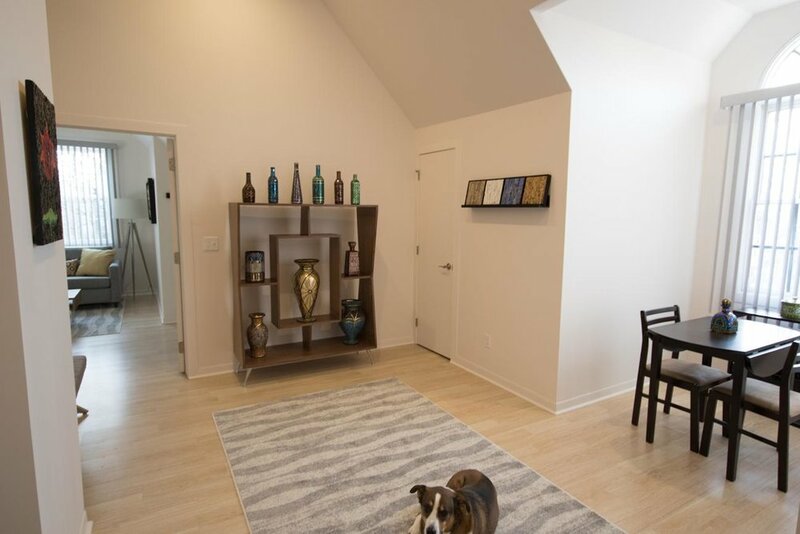 I'm going for a spacious, clean, light, and airy decor, so I'm keeping flooring and walls very neutral in color and light in shade. I ordered my flooring a few days ago. After much deliberation, I decided on a laminate in White Hickory. I had laminate in my old studio and it actually held up quite well over 18 years. The laminate was on sale, about .30 per sf less than the vinyl that I was considering. I just did not feel like the vinyl would hold up as well under the foot-crushing of pieces of glass and stone. The studio alone is about 1250 sf—AWE-SOME! We're using the same laminate throughout the new wing. I've ordered my shelving, thanks to a very generous birthday gift of $$ from my husband and two of my kids. I've also been looking into gallery hanging systems. I have some great new wall space and I love the look and apparent convenience of more professional-looking hanging systems. If anyone has any experience with these, I welcome your advice. Yes, I'm in that daydreaming, visualizing phase. I'm also in that slightly overwhelmed stage. It will be quite a job to set up a studio of this size—and it's not just the studio, it's the entire space. Then there is also the other end of the house with the new game room. I have not been blogging about that because it's not mosaic-related, but's it's been going on at the same time as the studio wing, although that project is not nearly as complex as the studio wing. We also happen to be replacing our roof and painting the exterior of the house right now. Yep, I'm ready for that vacation. But, still not complaining. Okay. Maybe just a bit. But it's all great! We are now at the end of the 4th week of construction. The studio and studio bath skylights went in on Friday, which was terribly exciting! When I came home from babysitting my two grand-loveys in the late afternoon, things had been cleaned up and looking pretty spiffy. The next week will finish up the ceiling duct work—it somehow got missed when they were doing the floor work for the studio—and then insulation around the end of the week. Maybe the walls will start going up next week. It's been a busy couple of weeks for me, making tile and floor decisions, among other things. Here's where we are at the moment. Let's start with the deck! This deck is much larger than I had originally envisioned—think balcony—but it kind of took on a life of its own under the influence of our architect. I don't care for the way it extends beyond the roofline, aesthetically speaking, but it's a lovely deck. We have jazzed up the deck with a nice lattice of 2' x 4's on the west side. On the east side, we extended the posts up and connected them, giving me a nice place for hanging flower baskets, chimes, and other pretties. And now for the inside! At the entry to the studio wing. I decided to move the doorway in further—pretty much straight ahead, instead of where I am standing. This will be an interesting area and I did not want doors swinging around in it. This pic shows just to the right of the previous pic. There is a nice attic dormer between the two new closets. I'll have some great wall space here. This is from the doorway into the living area. The kitchen is on the left. The bath and kitchen have been framed, and you can see the skylight in the bathroom, just to the left. Just before the entry to the studio. This was taken in the mid-late afternoon. I was so excited to see those skylights going in! I'm standing at the sliding glass door on the north end of the studio, looking in. 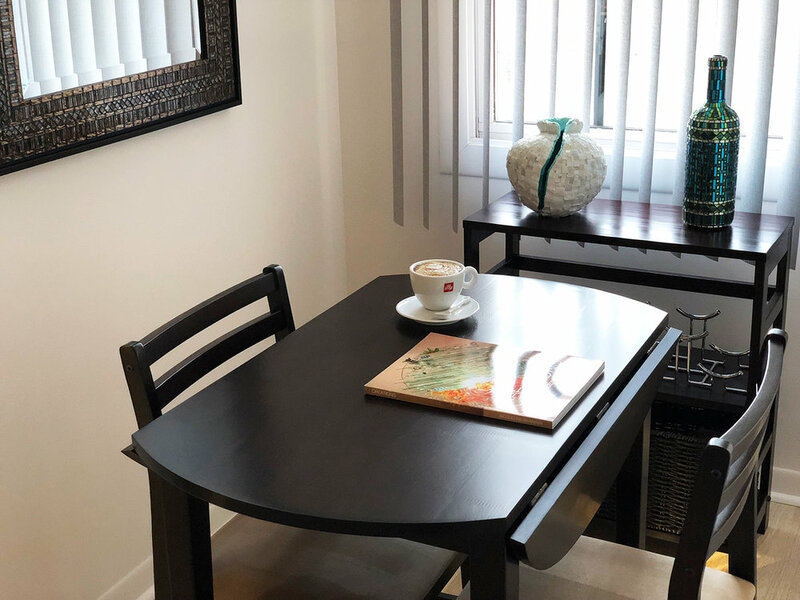 The transformation of this space is so remarkable! I'm now trying to prepare myself for the fact that it will look smaller once the drywall goes up. Not complaining! This whole project is fantastic and I am loving it—okay, mostly loving it! I'm excited everyday to see what is going to happen. Reporting in at the end of week 3 here. First, some current exterior pics. West gable and future office area. Also getting the deck stairway in. New shade garden area under the deck and stairs. It gets just a bit of late afternoon sun. East extension. Double window is in the living area and the single window is in the new kitchen. I'll show the interior progress with before and after shots as I think it makes more sense. After extension. I've added those two transparent gray 'walls' to help it make more sense. Looking toward that new east window. The area will be roughly half bath and half kitchen, with the bath just left of the window. Good progress was made on the new west gable—I have been mistakenly calling it a dormer—and on the east extension with shed roof—I have been mistakenly calling a gable. Our architect briefly explained the differences and I have a better understanding now. One of the insulation crew—at least I think he may be the culprit—stepped through the garage ceiling on Friday. This is getting ridiculous! A few months ago, when we were in the planning stage, an engineer slipped off a beam above the garage and stepped right through, just about a foot or so away from the new hole. On Monday of last week, one of the framers stepped through the ceiling of a small bathroom just off our laundry room, which is right next to the garage. That's three holes now. I hope they get that floor in next week. Just getting started on the new west gable at the beginning of the week. By the end of the day it was in. A smallish window because it's on the west. End of week and it looks right at home. The east extension looked a bit scary when they started. I still had my doubts that this would look alright. Okay, I feel better. Looks like it could have always been there. On a more personal note, I'm finding it to be a challenge to adjust to the new state of things. I'm not complaining, because I am so excited about the changes that we are making, not the least of which is my new studio. I'm guessing that anyone who has undergone a sizable renovation in the house in which they are living might know how I feel. I tried to prepare for it, psychologically, as best I could, but I did not completely understand how things would unfold. We are working on three areas of the house: the east end for the new studio wing, a pullman-style bath shared by two upstairs bedrooms, and the game room where my studio used to be. Additionally, due to delays and scheduling issues, it just so happens that our master bath shower is being redone at this time. We have a large house but, because of all this work, we are down to one full bathroom and barely two bedrooms. I've moved all of my studio, materials, and tools, as well as all other household storage, into the two guest rooms that we have. Truly, my storage skills are impressive. Because of the work on that pullman-style bathroom, my youngest son's bedroom is uninhabitable. He returns from college this Wednesday and I've just barely cleared out a small space in the guest bedroom with the one functioning full bath. Kinda crazy! I thought he would be a bit cranky over his summer accommodations, but he surprised me with his good humor about the situation. And then there is the experience of being without a studio that feels like an empty space, on both the inside and the outside. Although I have not been doing much, mosaically, for almost the last year, it feels very strange to have it all packed up, and to be without the ability to work or putter around. Ah well, all is well! 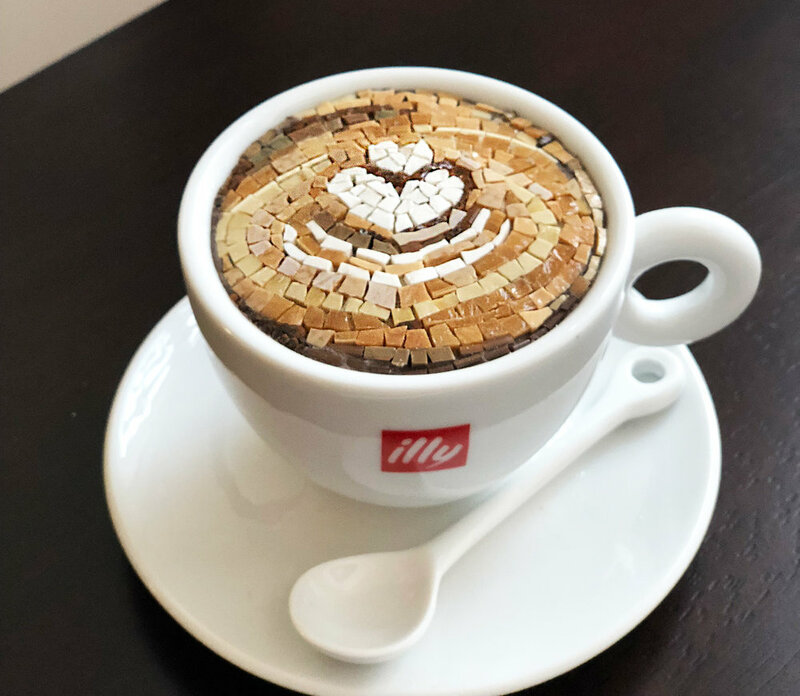 It's fascinating to see the new work transform from ideas and drawings on paper to physical reality—just like creating mosaics! Watching the progress, I'm learning things everyday—like the difference between gables and dormers. It's beautiful to see the space upstairs coming alive and opening up! A few more days of dust and loud noises. Yesterday, one of the framers accidentally stepped through a bathroom ceiling. He slipped off a beam up in the attic and punched his foot right through. Down came insulation and drywall, or whatever that puny kind of board is that was used for the ceiling. Stuff happens. I stepped out onto the deck last evening to take this pic, facing west. Those posts will be for the railing. They waiting on some lumber so they can finish the deck. And this looks out onto the east end of the deck. My wide-angle lens distorts things a bit, but this end of the deck is approx. 8' x 7'. In this pic, I was standing at the end of the upstairs hall. On the very left, you can see some of the plastic that they put up over stairway entry. We're looking at the new entrance into the studio wing. The entry will be french doors. The framing that you see just inside the attic, almost in the middle, is what remains of the linen closet. Our alarm system is at the top of that wall. Until Advanced Alarms makes it out here on Thursday and moves the panel, that framing has to stay. That grayish, striped wall on the left of that framing, is the stairwell, minus the insulation. I'm in the attic space here, looking north-northwest. They have started framing out a new wall and storage area that will be just before the entrance into the studio. This will be studio storage. Because, of course, the studio area of 34' x 12' could not possibly be enough, right? I have so much stuff! Directly opposite this new wall, on the east side, will be the new kitchenette and bathroom. They have to raise the roof, literally, for the kitchen and bath. Can't wait to see that come about! This photo was shot looking southwest, back toward the entry into the attic. That is a dormer window in the front of the house. I've got two new storage rooms, one on each side of the window, that have been framed out. These are intended for household storage, but I can't make any promises. 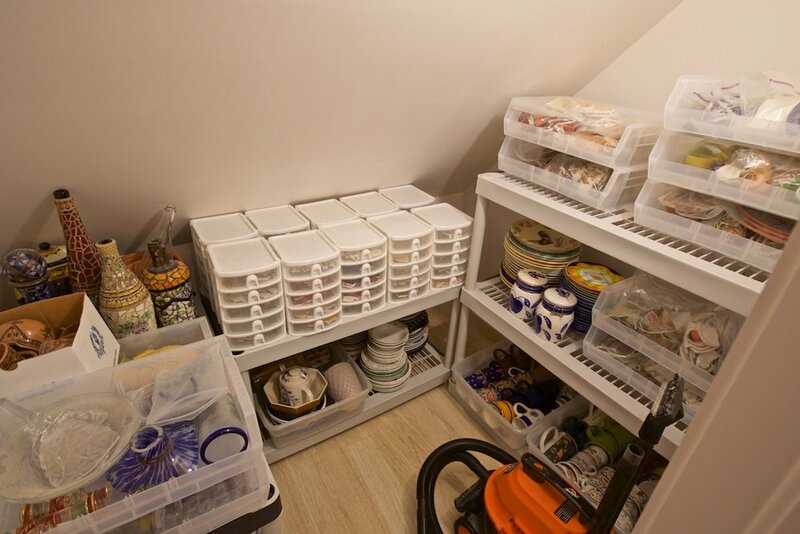 Although we are losing our very large walk-in attic space for storage, we never used a lot of it. I'm not a hoarder. I'm the opposite of that. I have an aversion to clutter. Except for mosaic materials, I don't believe in keeping stuff. Here's the beginning of the construction! Northwest corner of the garage. They have a good start on the deck. The stairs will start at the base of the closest post and lead up to the extended deck on the left. It's rather tricky to explain. On the east end—the furthest end—the deck is 8' wide; on the closer end, it is about 5' wide. It's a nice-sized deck. North end of the garage. Here, I was up along that rock retaining wall on the left, shown in the neighboring photo, taking a pic of the north end of the garage. You can see that the new sliding glass door has been installed into the area above the garage. Middle of the upstairs hall, looking east. 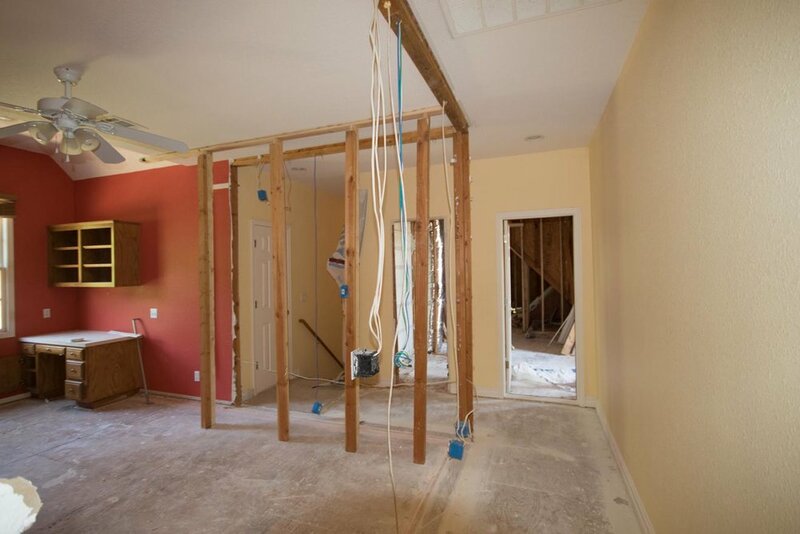 The corner walls of that 4th bedroom have been removed. The framing that is there is temporary. You can see, straight ahead, the doorway into the attic. To the left of the attic doorway, you can see a space that was the linen closet. And now you can also see the back stairway. Attic entry, looking east. It's difficult to see what's what here, but we're looking into the new living space/guest room area of the studio wing. They have started to frame out some walls and new storage rooms. On the left is the the insulated stairwell. The window will be replaced with a double hung. Looking north, above the garage. Not much new here, other than the door at the north end. Initially, I wanted french doors. However, the more I thought about it, I decided that the sliding glass door would be more practical. The evening of this day's construction, I was able to walk through the area above the garage for the first time. The framers had put down boards across the beams. I walked through from the attic all the way to the new sliding glass door. I looked out over my new deck, into the trees. Then I turned around and faced into the area that will be my new studio. I realized—I felt— that this area was now a space. This area that we had peered down for 18 years, that seemed rather spooky and dark, that we could not enter for lack of a floor, was now a space. It's as though it had come alive! Construction is finally underway to renovate our walk-in attic space and area over our garage to what I am calling the studio wing. 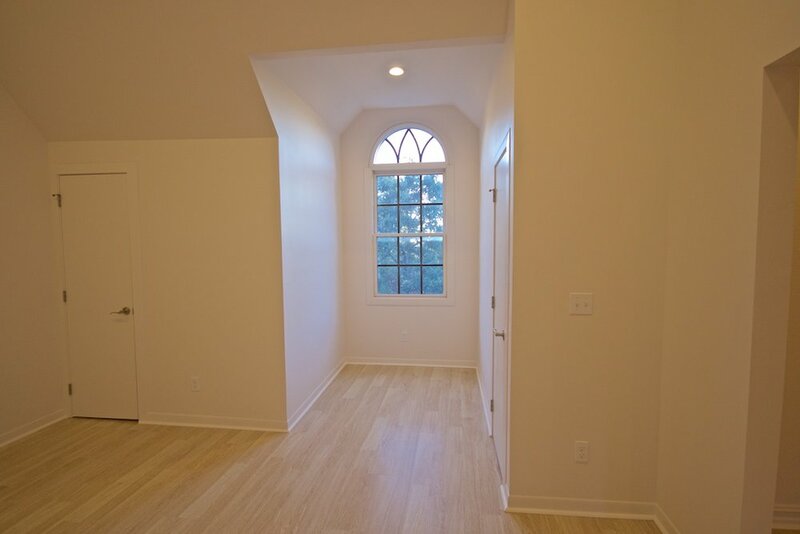 We will have a living area/guest room, including kitchenette and full bath, and a studio. All together, it's somewhere around 1100 sq. ft.
We are also doing a bit of work on what we call the game room. This is a large L-shaped room upstairs. My studio inhabited the small, lower part of the L. I say inhabited—past tense— because I had to clear it out this last weekend. I am currently without studio. The footprint of our house is basically L-shaped. The bottom of the L is the 4-car garage and the very east end of the house. The renovation area is in the bottom of L—the area above the garage and the walk-in attic above the east end of the house. I'll try to blog the progress of the construction of the studio wing as we go along. So, let's get started! East side of the house. The lower right shows the first garage door of the 4-car garage. There will be a shed—a dormer-like addition—over the first garage to accommodate the kitchenette and bath. 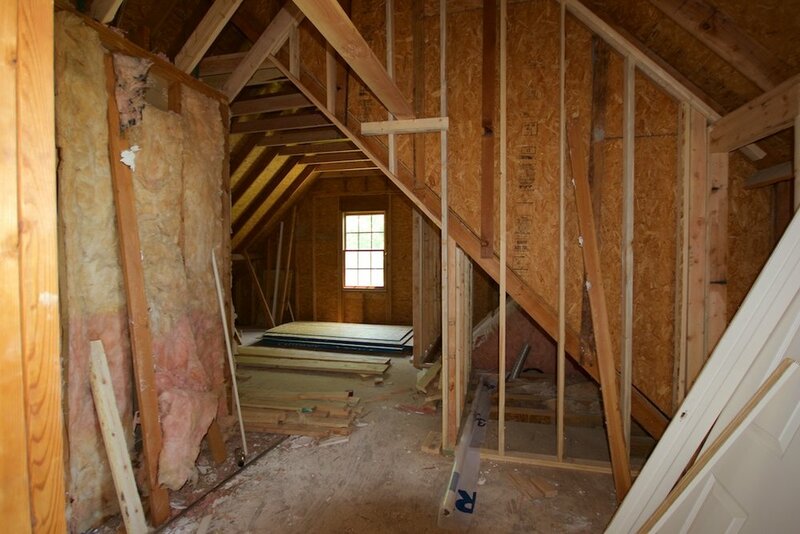 The window that you see is in the walk-in attic space, which will be the living area/guest room. North end of the garage. That window will be the entrance to my new studio. There will be a sliding glass door where the window is now, and a nice deck with stairs down to the ground level. West side of the garage. This is the back of the garage. There will be a 12' x 6' dormer in the middle-ish of the garage roof, basically the middle of the studio area. This will really help open up the 34' x 12' shoebox of a studio. Sorry for the blur. This is from just past the middle of our upstairs hall, looking toward the east. On the left is a door into a bedroom, which will be a casualty of our renovation. We'll be talking out about the eastern half of the room to open up that end of the hallway. The remaining half will be the new linen and storage closet. We'll also add a skylight. Directly ahead is the open door into the attic space over the east end of the house. If you turn the corner and go left, instead of into the attic, there is a linen closet—another casualty— right next to the attic doorway. 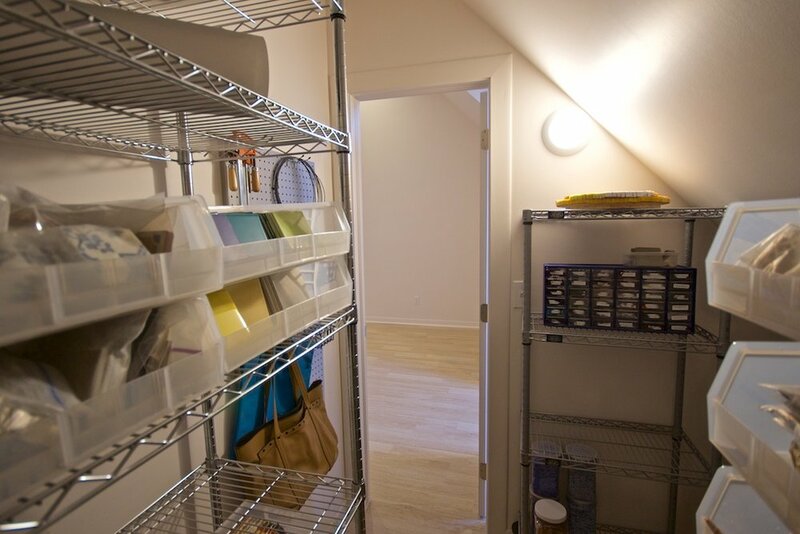 Then, after the linen closet, there is the back stairway that leads down into the laundry room. 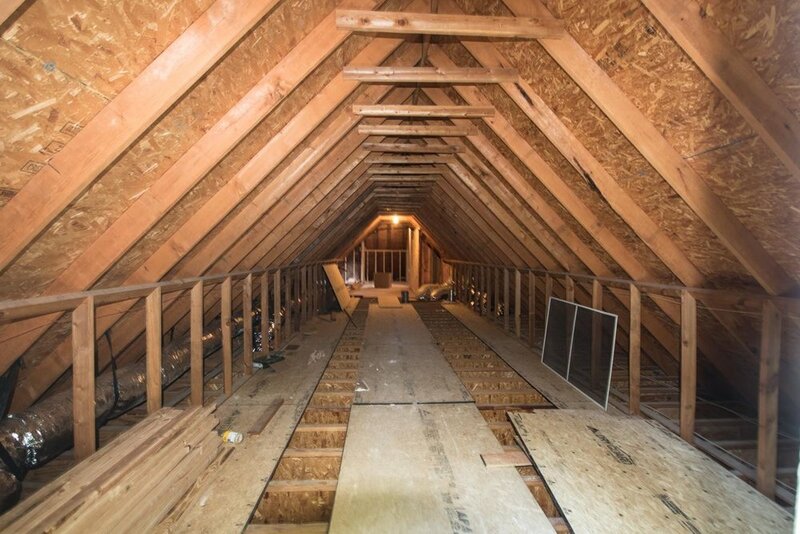 Here, I have walked into the attic and turned to the left, looking north into the area above the 4-car garage. At the end is that window that will be a sliding glass door leading out to the deck. The area from about the end of those vents on the left, to the window at the end of the garage, will be my new studio. On the left, there will be the 12' x 6' dormer. On the right, there will be 3 skylights in the angled roof. The kitchen and bath will be on the right, across from the vents. I'm taking this pic from what will be the living area, and there will be french doors between the living area and the studio. Since these pics, it's gotten noisy and dusty and crazy—and exciting—around here. I'll be back shortly!